Every day I battle to defeat the psychology of discrimination. Invisible discrimination creates work cultures in which very smart and capable people are systematically disempowered and slowly turned into compliant robots. I use the term invisible discrimination because bias is too benign. Discrimination results from using superficial factors such as gender, race, age, weight, social status, or job title to determine the responsibilities, opportunities, and resources people are given. When certain classes of people are systematically given lower power jobs, fewer opportunities, and resources, their positive impact is muted and their confidence extinguished. I find it ironic that many male leaders complain to me that women often lack executive presence that primarily comes across by projecting confidence with people who hold more senior positions. However, confidence only arises when people believe that their best efforts will result in success. When people consistently experience their best efforts and ideas being ignored or wasted it is only logical for them to lose their confidence. This is called "learned helplessness." It is at the root of disempowering workplaces. This is not a small problem. In fact, research by the Wharton School of Business revealed that 59% of employees feel disempowered. They feel their best efforts do not matter and in most cases, are not even noticed. These days I am frequently teaching male leaders the impact of the psychology of discrimination on women so I thought I would share with you the Seven Laws of Empowerment. First, I must warn you these laws are rarely followed so reading them might make you initially feel very frustrated and even more disempowered. But I encourage you to set your mind on solution-seeking so that you can help your supervisor empower you, and later I will show you how you might empower yourself. 1. "Trust Together" Build trust with those you work with. What I tell leaders is that when trust is strong, friction is low. Things get done better and faster simply because trust is present. 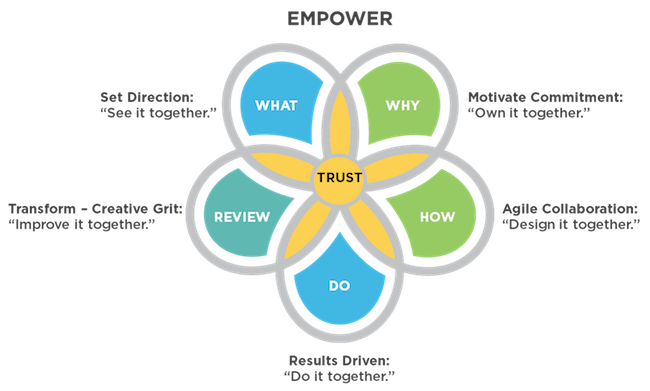 We build trust in four ways. A) Genuinely advocating for your teams' success rather than your own. B) Making and keeping relevant promises. Don't just promise to try. Promise to do. C) Contributing your expertise in a collaborative way. D) Holding everyone accountable for the results they commit to. No favorites, no excuses. 2. "See it Together" Articulate the vision; the future state you're committed to co-create. A clear, shared vision is the essential foundation of empowerment. 3. "Own it Together" Discuss and develop the strategy - the core activities that will most powerfully lead to fulfilling the vision. Establish your priorities. These are the key success factors that will make the strategy successful. Empowering leaders develop their leadership agenda for strategy and key priorities with their work teams. Alignment is achieved through collaboration. 4. "Design it Together" The design process popularized by Stanford University is based on the two ideas - that action ignites energy, and that continuous improvement invariably leads to the best results. This is where many leaders fail. The design process depends on universal collaboration and continuous learning from failure. If leaders are intolerant of failure or do not actively engage every team member, especially those who have quiet voices, the team will become compliant and descend into the spiral of groupthink. Groupthink is the state of superficial agreement when team members say "Yes" when they only mean "Maybe" For empowerment to thrive solution sessions should be held weekly and follow a discipline of universal, round-robin input followed by voting on the best ideas. Yes, this is very psychologically empowering. 5. "Do it Together" When an action path is decided someone must become directly responsible for the desired results. This means they also need decision authority. Responsibility without authority is inherently disempowering. This is a core reason why so many workplaces are disempowering. The job of the person in charge is to hold team members accountable for specific commitments. Accountability to achieve goals you committed to brings focus and dedicated energy. However, the team leader has one towering responsibility . . . to remove roadblocks. Team leaders who committ to make success as easy as possible are thrilling to work for. This is what it actually means to empower others. 6. "Improve it Together" Feedback is the engine of design thinking that enables an individual or a team to make continuous improvement. Empowerment thrives when failure is never final. In fact, failure is redefined as learning. When teams of people are hungry learners they become rapid improvers. Empowering feedback assumes that the person doing the work knows 90% of what they need to know already. So the empowering feedback dialogue goes like this. "What's working? Where are you stuck? What's will you do now? Is there anything I can do to make success significantly easier?" At this point if you don't feel your teammate is on the right track you simply ask "Would you like some suggestions from me?" 7. "Celebrate it Together" Recent research from UC Berkeley confirms that teams who celebrate are more successful. My motto is: "Recognize effort, reward results." This formula allows you to be both warm and strong. Managers who only recognize positive results and ignore honest, high effort will become despised. But leaders who reward effort without regard to results will become ineffectual. Do both. As you look at this research-based list of empowering principles you'll notice I am not cutting anybody slack because they come from a discriminated group. Anytime you lower performance expectations because of how people have been unfairly treated in the past, you are disempowering them. It's true that people who are the victims of systematic, invisible discrimination may need additional training, resources and coaching to achieve the same performance levels of advantaged groups, but that's exactly what institutional empowerment is. Be trustworthy. Make and keep promises that matter to yourself and others. Have a personal vision for your work and your life. Share it. Stand up for it. Engage others who will help you achieve your vision. Quit spending time with sad sacks who make you doubt yourself. Over-invest in healthy, positive relationships. Everyone needs fans and supporters. Your career and your life are a giant design project. You cannot fail if you don't quit. Life will not turn out the way you envision it but it might turn out better! Take responsibility for your results. Do not succumb to learned helplessness. Your inner story is your source of resilience. Science confirms that if you can read this you can learn to do anything. Seek feedback from trusted sources. Self-knowledge is our weakest psychological ability. Everyone close to you already knows your faults so there is no sense in ignoring them. Manage your worst faults so they don't derail your future. Build on your strengths. These are your gifts and using them will make you feel empowered. Celebrate your progress. Everything that has happened to you can be a source of wisdom if you allow it to be. If you want to feel great just do this every night before you go to sleep. Reflect on something you did that helped or encouraged another person. Put all your attention on the goodness of that action. Feel your humble self-worth. You will be empowered. Always remember, the great invisible work that makes visible work successful is making your self and others better. P.S. Most women feel unheard and undervalued in their workplace. Do you? Multiple studies confirm that women leaders are instrumental in leading companies to greater profits and now we know why. It's called the Women Effect and it arises from a distinct gender strength called CORE intelligence combined with female thinking versatility. Attend my live event to learn these skills and master the new tools that will change your work-life and your future. Learn more and register for the event October 26 & 27 in San Jose, CA.